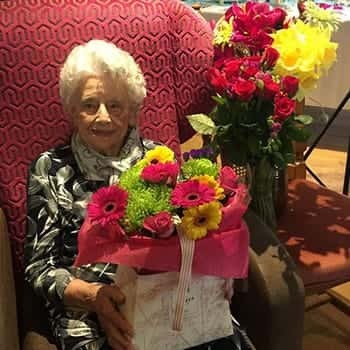 Marjorie Smith, a resident at Mill View care home in Bradford, has celebrated her 100th birthday in style this week. Care home Manager, Tee Tatum, pulled out all the stops to help mark Marjorie’s century. Tee said: “Marjorie has lived with us for the last year and in the run up to her big day she told us she would like a vintage tea party for her 100th birthday. She was keen to have everything decorated in her favourite colours of pink and blue and we were happy to oblige – the home looked lovely. Happy birthday from everyone at Anchor!